In spite of being a powerful mobile browser, Safari on iOS lacks in download management. Instead of allowing users to store downloaded files, it opens them directly for viewing (for supported formats) or provides the Open In option to export them to other apps. Third party download management apps could help you get around this issue. But, even though there are a bunch of download management apps on the App Store, not all of them implement all the necessary features. 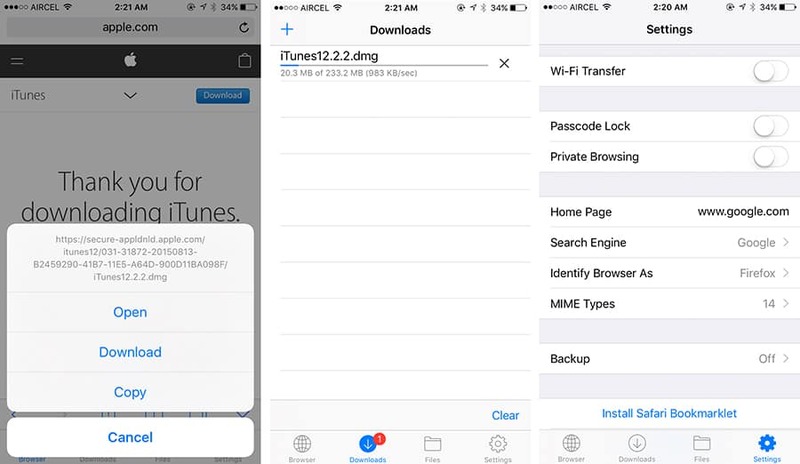 To be considered as a decent download manager for iOS, the app should primarily be able to download all file types, display download speed, provide resume support for in-progress downloads, etc. It should also allow you to export the downloaded files to other apps, and provide basic support for opening common photo, audio, video & document formats. Additionally, the ability to grab embedded media files from websites, fetch the download URL from download history, define custom MIME types, switch user agent, set default search engine, etc., are good features to look for in a download manager app. Security features, such as, passcode, Touch ID protection, may also be considered. In this article, we’ll explore a few free download management apps for iPhone, iPad and iPod Touch, which meet all or most of the above criteria. Total Downloader is a file and download manager for iOS that satisfies almost all of the above criteria. It’s built-in browser supports universal search, and has the ability to download any type of file formats. The UI is quite appealing, with its primary navigation being defined in the sidebar, instead of at the bottom. The sidebar also consists of a mini player, which provides playback controls for current audio or video track. From a particular web page, you can tap on a download link, and choose between whether you want to open or download it. Unlike many other downloader apps which directly open the file on clicking on the download button, TDownloader handles it in a smart way by letting you decide the subsequent action. The built-in web browser also supports multi tab browsing, providing you with a full web browsing experience. The Downloads tab lists all the active and inactive download tasks, which includes the current speed of download, size of download and other details. Tapping on a particular download will allow you to Pause, Resume or Cancel the download. Completed downloads appear in the files tab, from where you can play or open the file, or export it to Camera Roll (for photos and videos only) or to other apps using the Open In option. One of the most unique features of TDownloader, is its ability to grab embedded media links from specific streaming sites, like Facebook, Vimeo, Instagram, etc. But in order to avoid legal issues, it explicitly disables the grabbing functionality from certain sites that primarily host original copyrighted content from artists/creators. TDownloader also has certain features of a file manager app. It supports opening of common text, photo, audio, video, documents and archive formats, also integrating a bunch of cloud services as well, including Dropbox Google Drive, OneDrive and WebDAV services. Thus, you can directly sync the downloaded files with your preferred cloud service, and even stream media files from the cloud. Some of the other notable features of Total Downloader include private browsing mode, bookmarks and history management, user agent spoofing, PIN-protected folders and much more. The free version of Total Downloader is ad-supported. You can remove ads and upgrade to the full version of the app with an in-app purchase of $3.99. Files app is quite simple in its look and feel, yet powerful to handle any type of download link we threw at it. The app has four sections, a web browser, a download manager, a section for the downloaded files, and Settings. The built-in web browser provides specific settings for the default search engine, user agent (Mobile Safari or Firefox), and custom MIME types that defines how the app handles different types of download links. You can either type a complete URL or use a search phrase on the browser’s unified search bar. Files also has a Safari Bookmarklet, which allows you to transfer download links from iOS Safari browser to the Files’ built-in browser, where you can download from the available links. Even if a particular file type is not supported for download, you can manually define how the app handles it, by adding it as a new MIME type. Alternatively, you can tap & hold the download link and select Download Linked File As option. Note: If the download URL string is long, the action choices for tap & hold may not be visible fully, especially on small screen devices, such as the 4-inch iPhone. You need to scroll through the list of available options and select the preferred one instead. The Downloads tab shows all the active downloads, along with their download speed and progress. You can tap on the download and select Copy Address from the pop up to get its source URL or tap on the stop/resume button next to the download to control the operation as preferred. The app could also serve as a file manager, with built-in document viewer for PDF, DOC, XLS, PPT, TXT, HTML and RTF file formats, ability to extract ZIP and RAR archives, photo viewer and media player. The app provides decent import and export options for exchanging files with other apps, and also with other devices, including AirDrop/Share menu, iTunes File Sharing, FTP transfer, etc. The free version of Files provides for limited downloads and storage. To remove the limitation, you can upgrade to the Pro version via in-app purchase, for $4.99. Documents is one of the most popular file management apps on the iOS platform, but also serves as a decent file downloader, especially because of its native support for a wide variety of file types both for viewing as well as for downloading. Being a full fledged file management app, you can organize and store your files, and view them without having to export them to any other app. You can download or copy the link address by tapping and holding a particular download link in the built-in web browser. In the Downloads tab, you can see the status of your downloads, but the app does not provide significant controls in this regard. You can only stop or start a particular download on the list; resume support is not currently provided. Documents supports various user agents, which can be handy if you’re trying to download files from a specific version of a particular website. The user agent can be set from the app settings, from an extensive list that includes Mobile Safari, macOS Safari, Google Chrome, Firefox, and even Internet Explorer. Documents app is completely free without any limitations or ad support. You can learn more about the versatile iOS file manager app, in our dedicated article. Note: Despite missing out on some of the primary features of a typical download manager, Documents app still makes it to the list due to its powerful file support and management features. Offline is another file downloader app that serves as web browser, file downloader and file manager, built into one app. Its universal search bar lets you visit a website by typing an URL, or search a particular keyword using the default search engine, configurable in settings. You can also choose between multiple user agents, depending on the version of the website you want to access. As a download manager, the app does have a few caveats, such as lack of download controls (pause & resume), inability to display download speeds, etc., though it supports downloading nearly all types of files. One surprising fact about the app is that it explicitly mentions the lack of download support for audio and video content due to App Store guidelines. But in our tests, the app could easily grab videos from popular video sharing sites. Offline is ad-supported and free to download. But there isn’t any in-app purchase option available to disable ads within the app. Moreover, a particular section of the in-app settings allows you to “watch ads” voluntarily. Note: Due to App Store’s policy restrictions, it is possible that the app might be pulled sooner or later. These were some of the iOS file downloader apps that caught our attention. If you think that we’ve missed a good one, do let us know in the comments below.